As discussed in a previous article titled “Triage for Survivors of Natural Disasters or Terrorists Attacks”, triage is the “the assignment of degrees of urgency to wounds or illnesses to decide the order of treatment of a large number of patients or casualties.” The triage process is designed to identify those victims that have life-threatening injuries to place them in priority for medical treatment when emergency personnel arrive at the scene. However, not all survivors of a natural disaster have life-threatening injuries. These individuals with less critical injuries may still require basic first aid care. In fact, depending on the extent of the injury, some non-critical or non-emergency injuries may progress and become serious if they do not receive appropriate care. CERT trained members can play an important role in caring for injuries like burns, fractures, ligament sprains, minor wounds, and hypothermia. 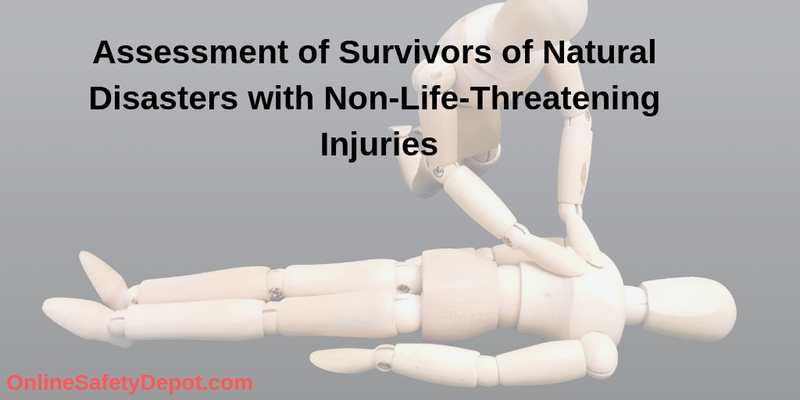 To find and identify these injuries trained individuals conduct a head-to-toe assessment. This head-to-toe assessment is more of a secondary assessment (not the quick assessment to determine if life-threatening injuries are present on a victim – no breathing, excessive bleeding, and signs of shock) and more thorough to detect all injuries and the extent of those injuries. It is important to note that all survivors of a natural disaster or terrorist attack should be assessed to ensure that no injury, regardless of its extent, goes unnoticed. As indicated in the name, “head-to-toe” assessment, this process begins at the head, a more vital area of the body, and moves downward to the toes. This type of an assessment can be conducted on both conscious and unconscious individuals. For conscious individuals, the rescuer should begin by asking the survivor for permission to conduct the assessment. This is important as the victim has the right to refuse treatment and any forced assessment on the person could result in legal action being taken again the rescuer. During the assessment the rescuer should continually communicate with the victim to explain what is being done to them. A = Alert. Look, listen, and feel for anything unusual by paying close attention to the head-to-toe assessment process. C = Cautious: There are certain injuries that could be made worse through movement, such as a spinal or head injury. Because of this potential, the victim must be treated cautiously and without forceful or unneeded movements. C = Consistent: To help ensure that nothing is left unexamined, each assessment conducted by a rescuer should be systematically completed, from head-to-toe, the same way every time. T = Thorough: Because the life-threatening injuries and conditions were assessed for in the initial quick assessment, this head-to-toe assessment should be completed in its entirety before beginning any treatment. A change in the consciousness of the victim, including moving in and out of consciousness. This can be a sign of head trauma and altered mental function. The inability to move a body part or tingling or numbness of a limb. This can indicate damage to the spinal cord or even a peripheral nerve. Difficulty in breathing, of a condition called paradoxical breathing where a segment (fractured) of the rib cage moves in the opposite direction of the rib cage during inspiration and expiration. Altered vision, dilated or unequal pupils. This too is a sign of head trauma and potential intracranial swelling. Deviation for normal spinal alignment, or deformity to the head, both sign of significant trauma. Signs of blood in the ear or nose. This can be a sign of a fractured skull. Bruising and discoloration behind the ear or around the eyes. These too could be sign of a fractured skull. Nausea and vomiting. These can be a sign of head trauma, shock, and other neurological damage. The victim assessment is the time and place to meticulously look for signs and symptoms of injury to the survivor so that if determined, appropriate treatment protocols can be initiated to help minimize the risk of further damage to the victim and for the best outcome.